Stitch Fix is planning an IPO and has already filed confidential paperwork with the U.S. Securities and Exchange Commission, according to Recode. But there isn't an official Stitch Fix IPO date yet. Founded in 2011, Stitch Fit started as an online clothing subscription service for women, but has since expanded to include men's clothing as well. With revenue of $730 million for its fiscal year ending July 2016, the startup has come a long way from shipping orders out of an apartment. But does revenue quickly approaching $1 billion mean you should buy Stitch Fix stock when it goes public? Through its website, Stitch Fix customers fill out a "Style Profile." The profile asks questions about a person's size, style, shape, budget, and lifestyle. According to Stitch Fix's website, completing the profile takes between 10 and 15 minutes. After completing the profile, each customer is assigned a personal stylist. The stylist uses the information from the profile to select clothing that matches the customer's taste. An Incredible Win Rate: Shah Gilani's Zenith Trading Circle subscribers have had the opportunity to make average gains of 44% per day (including partial close-outs) playing his recommendations. His win record is insane (in a good way). You've got to check this out – just click here. The personal stylist ships five items of clothing directly to the customer for a $20 styling fee. The customer can try on the clothes and decide which to keep, then sends the rest back. Stitch Fix sends its customers a prepaid USPS envelope for returns. Customers are only charged based on which clothes they keep. The recipient pays for each clothing item they wish to keep, and the $20 fee is applied as a credit. Stitch Fix members have the option of setting up automatic deliveries, or they could just order clothes as they see fit. Who Is the Founder of Stitch Fix? Katrina Lake is the founder of Stitch Fix. Before starting Stitch Fix, she worked with traditional brick-and-mortar retail clients. According to a 2014 interview with The Mercury News, she became interested in innovation in the retail industry and new retail concepts. She applied to the Harvard MBA program in 2009 with the intent to start her own company. While attending Harvard, she shipped the first Stitch Fix order out of her apartment in 2011. Lake grew the company from a startup in her apartment to a company with $730 million in revenue for the fiscal year ending July 2016.
Who Are Stitch Fix's Competitors? Trunk Club was founded in 2009 by Joanna Van Vleck. It started out as a personalized style service, but was purchased by Nordstrom in 2014 for an estimated $350 million. Trunk Club's clothing is priced similarly to high-end department stores, with price points between $100 and $300 per item. In comparison, the average price point per item for Stitch Fit is $55. Trunk Club customers are also charged a fee, and the $25 styling fee is credited towards whatever items are kept. However, Trunk Club hasn't been as successful as Stitch Fix. In 2016, Nordstrom reported it was taking a $197 million write-down on Trunk Club. From the $350 million the department store paid in 2014, that's a $153 million loss. In comparison, Stitch Fix is seeking a valuation between $3 billion and $4 billion, according to Recode. On March 17, Amazon.com Inc. (Nasdaq: AMZN) launched a feature to its Prime members called "Outfit Compare." Through the Amazon shopping app, Prime members can load two pictures of themselves in two different outfits they're deciding between wearing. According to TechCrunch, an Amazon stylist will send you a response "a minute later," telling you which outfit looks best. There isn't a clear indication of why Amazon launched this service. However, TechCrunch speculates Amazon could use the collected data to make better shopping recommendations for customers in the future. The online retailer could also enhance the feature with suggestions on accessories to add to the outfit that are sold through Amazon.com. Eventually, Amazon could incorporate the Outfit Compare feature into a new service that rivals Stitch Fix. The e-commerce giant is already building its own fashion line, with eight private-label brands as of March 2017. 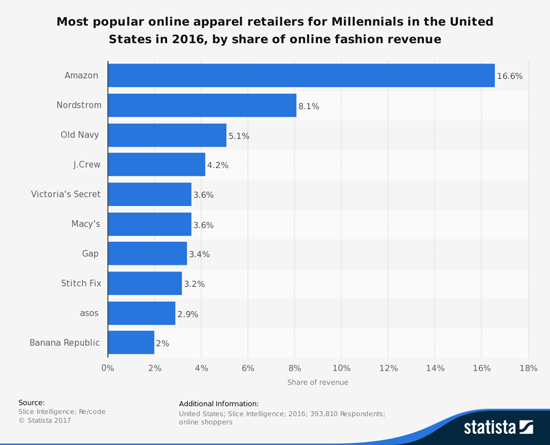 Amazon accounted for 16.6% of U.S. millennial online fashion spending in 2016, and that number could climb in 2017 with new services like Outfit Compare. In comparison, Stitch Fix only accounted for 3.2% of U.S. millennial online fashion spending. When Will Stitch Fix Go Public? According to a July 29 Recode report, Stitch Fix filed confidentially to go public. A confidential filing allows "emerging growth" companies to file with the SEC in order to receive feedback from the commission. It helps to protect sensitive information from rivals until the company files publicly ahead of its IPO date. It also prevents investors and the media from scrutinizing the company before it's completely ready to go public. Public scrutiny could turn off some retail investors from wanting to purchase the stock if the company appears unready. As of right now, Stitch Fix has not set an official IPO date. What Is the Stitch Fix Stock Symbol? We're still waiting to see what the Stitch Fix stock symbol will be. Most likely, the company will choose a symbol that allows the retailer to be easily identified by investors. For example, the company could choose "STITCH." Whatever the ticker turns out to be, retail investors can't start buying Stitch Fix stock until the Stitch Fix IPO date. That leads us to the most important question: Should I buy Stitch Fix stock? Should I Buy Stitch Fix Stock?